See the featured quilts and web-exclusive color options and projects from the American Patchwork & Quilting October 2018 issue. The October 2018 issue of American Patchwork & Quilting is on sale from August 7--October 1. The Sunshine and Shadows Log Cabin block setting plays up the contrast of light and dark 19th-century reproduction prints. Bring to mind a day at the beach with rows of fabric representing the sea, sand, and sky. Stitch a wall hanging that is a treat to complete. Merry--not scary--faces will greet trick-or-treaters this Halloween. "I combined two each of my favorite blocks for a quick-to-make Halloween decoration," quilt tester Colleen Tauke says. "Adding colorful sashing and setting squares nicely frames each block." An antique floor register provided the spark for an intricate table topper. English paper piecing and fussy cutting make construction go smoothly. You’ll be a star after completing this table runner, which uses English paper piecing, machine appliqué, and machine piecing. Solid white provides a bright canvas for showcasing saturated harvest hues. Instead of autumn hues, quilt tester Martha Gamm used summertime brights, including florals, gingham, dots, and a border of nautical flags, in her version of Fall Beauty. "It was worth the extra time and fabric it took to miter the border," Martha says. Place hexagons in an elongated pattern for yet another arrangement of the classic shape. "For a summer-theme version of Small Wonders, I pulled the pink, cream, and green prints from a multicolor fabric collection," editor Jody Sanders says. "Instead of trimming the quilt edges and sewing on a border, I appliquéd the quilt center to a floral 18×22" rectangle. Because the cream print outer pieces of the quilt center match the floral background, the ‘flowers’ appear to be growing in a garden." Pieced and solid fans in striking hues create motion and contrast against a light background. Quilt tester Colleen Tauke created a seasonal table topper out of autumn-inspired fabrics that have accents of metallic gold. "I selected the border fabric first," Colleen says. "I used the large-scale sunflower and leaf fabrics for the ‘plain’ fans to showcase the prints. To add a sense of whimsy, I used the same print in two colors for the inner border." 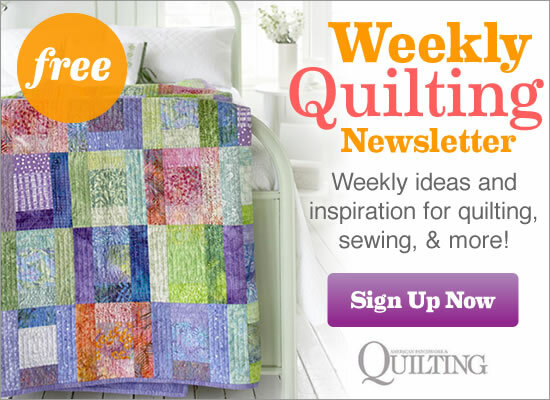 Gather solids in Amish-inspired colors to re-create an antique quilt sprinkled with make-do blocks. Managing editor Janet Klockenga used reproduction prints from the mid-1800s to make a four-block table topper. Preserve the rich hues of your summer flower garden in a scrappy string-pieced wall hanging. String-piece flowers in bright fabrics for a scrappy summertime wall hanging. Fresh, cool batiks evoke a nautical feel in a quilt featuring the Courthouse Steps block. Managing editor Janet Klockenga created a table topper or small wall hanging version of Seaside Steps using modern florals. "I enjoy re-creating a classic block like Courthouse Steps out of contemporary fabrics," Janet says. "It’s sometimes surprising how different from the original your creation can look!" A cozy vintage throw in solid Cheddar yellow, cream shirting, and muslin exudes a harvest-season glow. In this table topper version of Cheddar Pinwheels, the use of a greater mix of mottled jewel-tone fabrics in the border adds interest. The bottom left-hand Pinwheel block has its blue triangles in a different orientation than in the other blocks, reflecting the whimsy of the original quilt.